Claude Monet, 1840-1926, one of France’s famous artists in art history, painted the " Red Boats at Argenteuil", in 1875. Impressionism is a style of art, a system or technique using patches of paint to represent forms in nature, not detailing objects, as they truly exist in nature. Impressionism is not a study of light, it is another and different art system or method used to represent form and light just as a realist uses smoothed, gradiated paint to represent light and forms in nature. Both are legitimate forms of expression in art. In one of Claude Monet's famous art paintings "Red Boats at Argenteuil" the water is painted in quick patches of varying values of blue instead of one solid mass of blue representing water in traditional method of art painting. The strokes of reflection in general, and the strokes of reflection in particular from the boats, are intermingled with the blue strokes of the water, sometimes in mass, blocking out the blue, and other times thinned out as reflection dissipates around the edges. Light, in Monet's "Red Boats at Argenteuil", is represented by color and color values. A yellow in the largest boat has lavender added within the yellow as it reaches the waterline .The key in representing shadow for Monet here is using a different color or hue close to the same value as the yellow, but a bit darker. The lavender becomes the shadow of yellow even though lavender is not a part of yellow. This example is not a study of light it is a study of color and color values representing light and shadow. The strokes of paint representing the boat’s reflection, are intermingled with these blue strokes giving the impression of the boats reflection on water. Where the boats reflection is heavily saturated on the water the blue water strokes disappear entirely, and as the boats reflection thins and vanishes into the water the quantity of quick strokes representing the boats reflection also thins and dissipates back into blue strokes. Impressionism art seems to work best when the eye and brain can't comprehend the details of what is being viewed. In Claude Monet's art painting, "Spring Trees by the Lake" 1888, Impression works because the eye can't possibly see all the individual leaves and branches. The eye and brain can't compute or comprehend the ever-changing values of light and reflective colors in the water, but it can when facing large static broad close in areas. In Monet's many famous paintings studying light in art history, in particular the "Rouen Cathedral" 1894, Impressionism, and it's patchworks of color doesn't seem to work. The eye and brain can comprehend the detail of the greater surface area, mainly because one closer to the large surface area. Claude Monet's own garden was perfect subject matter for his art and loosening style in the latter1990's due to the varying values of color in the water, and water reflections. In his loosing style water, air, light and all substances began to fuse together without linear boundary. In Claude Monet's large art painting of "Water lilies", 1925, he paints with longer, more sweeping strokes, where the strokes themselves have more relationship to each other than they do to the objects they represent. 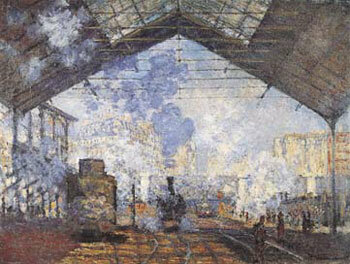 Other famous artists of Impressionism in art history are Renoir, Sisley, Van Gogh and Seurat. To view gallery 1 of Claude Monet posters click here. To view gallery 2, of giclee’ reproductions click here.